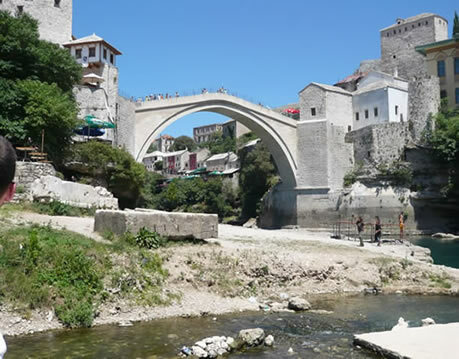 The 30m-long, 20m-high, single-span Mostar bridge known as 'Stari Most' (Old Bridge) was built by Ottoman Turk Architect Mimar Hajrudin in 1566 of 456 blocks of stone. It was blown up by Bosnian-Croat forces in November 1993. Old Mostar Bridge was an UNESCO world heritage site, including eleven other historical buildings constructed in Ottoman Turkish era.